Not only that but Karl Rove thinks Mike Castle might retire. 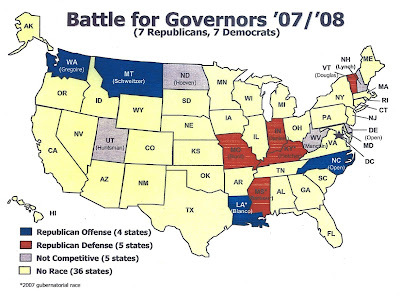 In the the same PowerPoint check out page 25 - 2008 GOP House Defense, where Castle is listed as a secondary GOP "defense" with an asterisk, denoting "Member may not seek re-election." You'd think that as the mission of every agency in the government was turned to political purposes by the Bushies someone, say a "moderate" Republican Congressman froma "safe seat" would have had the guts to stand up and say "Hey. This is wrong."